Microsoft's second attempt at its very own fitness tracker got official in October, and now it's in the process of receiving a software update that enables some new features. 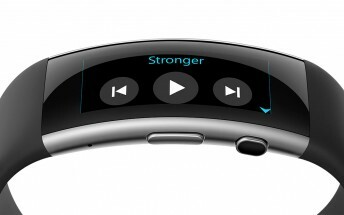 First off, the Microsoft Band 2 has received music controls, letting you pause or play, skip forward or back and adjust playback volume - all from your wrist. The wearable displays the title of the currently playing song too. This works with any music app on your phone through the magic of Bluetooth. Next up is the possibility for you to receive notifications telling you to move when you've been still for too long. Thankfully this is optional, and you can choose the time intervals and the days in which you want to be nagged to get up. And there's even a blackout period to be picked, useful for when you're sleeping or driving. When you use the Exercise tile you are now able to pick the exercise type. Then when you review your sessions in the Microsoft Health app all the information will be grouped by exercise type. Finally, from now on the What's New tile will automagically appear on your Microsoft Band when new updates for it are available.